Avi Vantage includes a geolocation database for identifying the origin of clients. This is a fixed database based on the MaxMind IP-Country and IP-ASN data. The database is maintained on the Controllers, and incorporates database updates when the Controllers are upgraded. The geolocation data may be overwritten or augmented by creating a custom IP group. For example, create a new IP group called “Internal” and add 10.0.0.0/8 and 192.168.0.0/16. 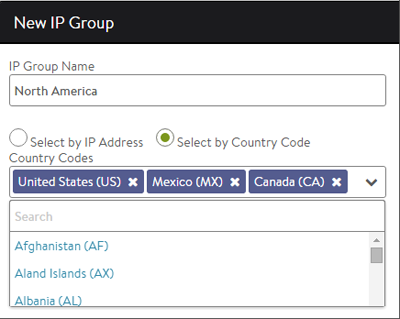 Alternately, create a new IP group with Select by Country Code. In the example, the group is named North America and includes US, MX, and CA. Note: A custom IP group will override only the geolocation database for the tenant were the IP group was created.